In quiet December, our gardens have short days, patterns in ice, drifted snow, bare branches, snow-capped bird nests, dried stalks, and hardy winter animals. Indoor garden tasks are in progress: writing summaries of last season and turning to plans for the next. Dormant-season outdoor tasks (trimming along paths and pruning) are balanced by research and reading. Three books published in recent years will interest those considering or developing Midwestern native plant gardens or restorations. Gardening with Native Plants in the Upper Midwest: Bringing the Tallgrass Prairie Home (by Judy Nauseef, University of Iowa Press, 2016) covers basic principles of native garden design, illustrated through specific projects and examples. The author, a landscape designer and gardener, describes and draws from the unique character of the Midwest to design home landscapes and larger-scale plantings. Her detailed descriptions of designing near structures and hardscaping will be useful to homeowners. The author includes suggestions for specific areas, like front entry gardens and rain gardens for drainage areas. She includes a short section about practical garden maintenance, as well as sharing her experience with typical changes in prairie plantings over time. This accessible, compact book provides good basic native gardening design tips and echoes the broader ecological principles Doug Tallamy has championed for creating gardens full of life. Native plant gardeners are always interested in plant ID resources, and The Prairie in Seed: Identifying Seed-Bearing Prairie Plants in the Upper Midwest (by Dave Williams, University of Iowa Press, 2016) is a useful reference. 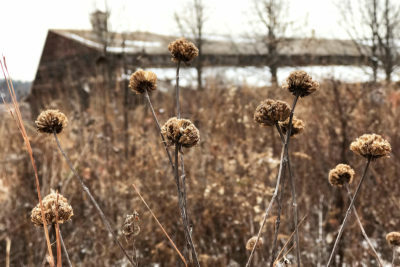 It can be used late in the season (even in December, for some species) to identify prairie species from their seed heads and seeds. Each species is illustrated with close-up photos of the plant in full flower and with mature seed heads. Individual seeds for each species are shown on a scale, illustrating the shape and features. This is especially helpful for learning species that have other material (bracts, chaff) mixed with the seeds after harvest. In addition to the plant descriptions, the author includes tips for harvesting and cleaning seed from each species. Comprehensive charts include flowering and ripening timing throughout the summer and fall seasons. Williams groups and organizes the species by the type of seed head, shown in silhouette, just as you would see them in the field—perhaps against a light December snow. Ecological Restoration in the Midwest: Past, Present, and Future (ed. By C. Lenhard and P. C. Smiley, Jr, University of Iowa Press, 2018) takes a wide geographic (examples and case studies from Minnesota to Ohio) and temporal look at ecological restoration and the challenges that face practitioners and communities in a changing world. The book’s three sections treat history and theory of restoration; case studies of long-standing restoration projects, lessons learned, and growth in restoration projects more recently; and restoration’s future in light of rapidly changing climate, stormwater impacts, larger watershed and water quality issues, invasive species, agricultural landscapes, altered ecosystem services, and ever-expanding urbanization. Local readers will be interested in the chapter describing Curtis Prairie. Because of the pace of change in the environment and our work, readers can keep up with recent and current restoration work through the Arboretum’s communications and website. I valued the emphasis on waters and watersheds in relation to both agricultural and urban systems. This is a comprehensive book and worth the reading time. As winter sets in, then turns imperceptibly toward another garden season, let’s read!